Jay Rossiter, senior vice president of Yahoo’s Platforms and Personalization Products division announced Stamos’s new executive post on its Tumblr page yesterday. Yahoo officials would not comment on his appointment, which replaces the company’s former vice president of information security, Justin Somaini, who left Yahoo in January 2013 and has since taken a position as “chief trust officer” at Box. It’s been speculated that Somaini resigned from Yahoo after reportedly coming under fire amid spam-borne cross-site scripting (XSS) hacking attacks that plagued the revamped Yahoo Mail last year. 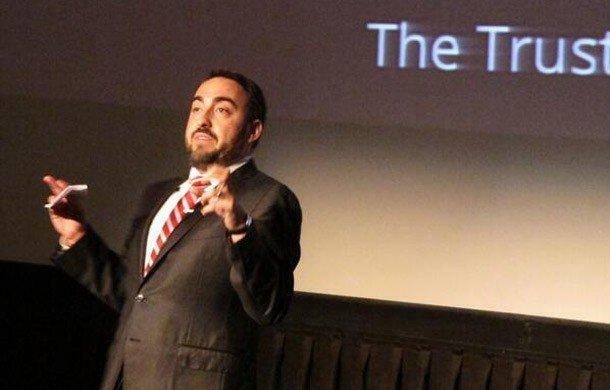 The San Francisco-based veteran information security researcher known for his authoritative expertise in cloud computing, web, mobile and network applications security and beyond, humbly describes himself as a “security guy” in his Twitter bio. But that’s hardly an adequate encapsulation of Stamos’s widely respected cybersecurity prowess, acumen and career accomplishments. 1. He’s a longtime respected leader in the information security space. 2. He’s an outspoken critic of U.S. surveillance operations. He spoke about “Trickle-Down Cyber Warfare” at the 2012 RSA conferences and about BYOD mobile security at the 2013 conference, before news of the company’s intel share-happy relationship with the feds broke. Earlier, on June 7, 2013, Stamos published an often-cited blog post on his personal blog titled “A Taxonomy of PRISM Possibilities.” It presents an exhaustive list of theories and possibilities relating to the federal mass electronic spying program program, peppered with his own commentary in italics throughout. 3. He’s a top keynote speaker at some of world’s leading information security conferences. TrustyCon is only the latest in a long list of high profile security conferences Stamos’ has headlined. He’s also spoken at several similarly top level information security conferences, including Black Hat, DEF CON Hacking Conference, FS-ISAC, Microsoft BlueHat Security Briefings and Infragard, a partnership between private sector and the FBI. 4. He tweets… a lot! Of course, now that Stamos is the head honcho of security at Yahoo, his Twitter account activity might slow down or perhaps even stop altogether. Though if CEO Marissa Mayer’s own moderately active Twitter feed is any indication, it probably won’t. Up to this point, Stamos has tweeted quite a bit, often commenting multiple times per week, and sometimes per day, about various online privacy- and security-related topics, as well as about industry events he supports, attends or speaks at. He recently took to Twitter to caution users of the popular “anonymous” tell-all Secret mobile app causing a stir in Silicon Valley not to spill “inside” information on the controversial app, which might not be so secret if authorities subpoena its developers. Dear Silicon Valley, it's unlikely that "Secret" is secret from a subpoena. Do not throw inside information up there. Seriously. Stamos’s latest retweet is fittingly a tweet welcoming him aboard from his new company’s official Twitter account. On Slideshare, another social sharing site, Stamos has also posted 10 incredibly detailed, super techie and pretty mind-blowing information security presentations.